South pole star Sigma Octantis (of the constellation Octans) is on the left of this starry expanse spanning over 40 degrees across far southern skies. You’ll have to look hard to find it, though. The southern hemisphere’s faint counterpart to the north star Polaris, Sigma Octantis is a little over one degree from the South Celestial Pole. Also known as Polaris Australis, Sigma Octantis is below 5th magnitude, some 25 times fainter than Polaris and not easy to see with the unaided eye. In fact, it may be the faintest star depicted on a national flag. 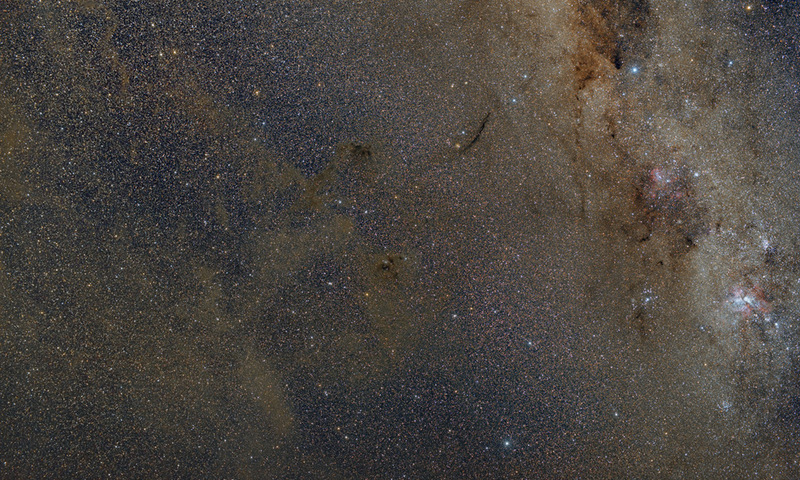 The remarkable deep and wide-field view also covers faint, dusty galactic cirrus clouds, bounded at the right by the star clusters and nebulae along the southern reaches of plane of our Milky Way galaxy. Near the upper right corner is yellowish Gamma Crucis, the top of the Southern Cross. Easy to pick out above and right of center is the long Dark Doodad nebula in the southern constellation Musca, the Fly. Posted on Thursday, 28 June 2018 by VGC	This entry was posted in ifttt-photograph and tagged IFTTT, NASA. Bookmark the permalink.